You may have caught this graphic making the rounds on social networks - or maybe it's just the friends we keep that brought it to our attention. What you're looking at is the change over time in the diversity of a selection of food crops available to growers. The upper part of the graphic portrays the surprising number of varieties available for a number of foods: 408 types of tomato seeds, 285 different cucumber varieties, 288 different types of beets, 307 types of sweet corn, and 341 varieties of squash are just some examples. Compare that to what was available 80 years later in 1983: 79 types of tomatoes, 16 types of cucumbers, 17 varieties of beets, 12 kinds of sweet corn and 40 types of squash. These differences are quite astounding, and it's important to remember that the decline in seed varieties doesn't just mean less of a selection at your local supermarket. 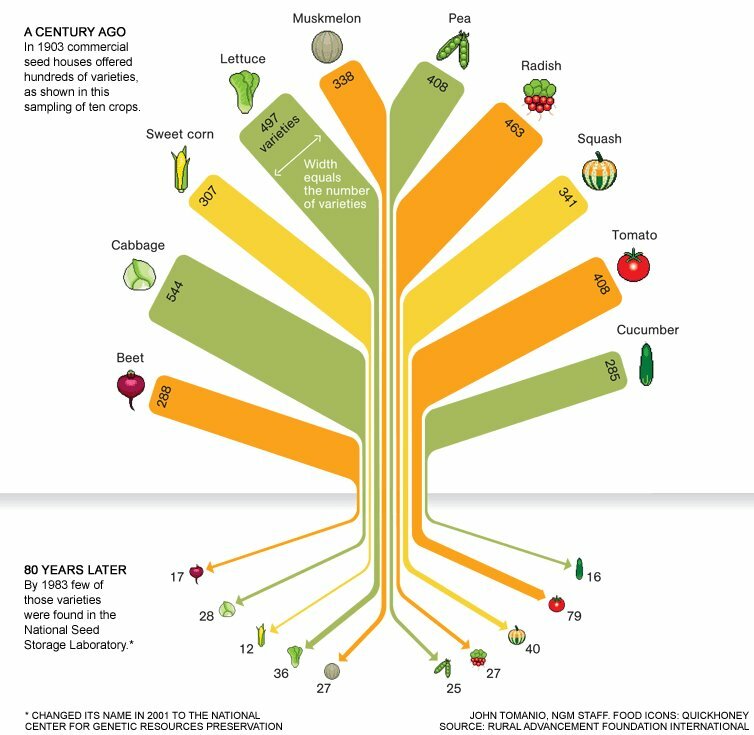 Most of the food plants we have today are a direct result of that huge diversity that we created in the past. That diversity allowed humans to expand our settled territory, feed growing populations, and become who we are today. By reducing the diversity of food plants that we grow, we are putting our very own livelihood at great risk. A less diverse food system, such as we have created today, is much more vulnerable to drought, floods, pests, fungi, and anything else that might affect growing crops. As extreme weather events appear to be on the rise around the globe, this could become a serious problem. Some farmers around the world continue to cultivate a wide variety of food crops. These farmers are often indigenous peoples who carry on traditional forms of agriculture passed down through the generations. If you're a regular reader here, you know that traditional lifeways are threatened all over the globe. Here is yet another reason to support efforts that seek to revitalize and maintain traditions wherever they may be practiced. Maintaining diversity in all of its forms is necessary in a time when the challenges we are facing are just as diverse. The more options we have to turn to in times of stress and distress, the more likely we are to succeed in overcoming those challenges. The good thing is that the internet has made it a little easier for heirloom varieties of foods to get into the hands of the people who want it. Still, it is very scary that we have allowed companies to dictate what type of each food we will eat and in turn have missed out or lost a whole slew of others. J-Fur always spoke about the 200 varieties of potatoes she saw in Peru compared to like 5 that I see at grocery stores around here.